Today, I will introduce some new products of Next Level to you all. First of all, let’s see a new tank for ladies. Next Level Apparel Ladies’ Jersey Racerback Tank is made of 57% combed ringspun cotton, 38% polyester, 5% spandex jersey. Tear-away label provides tag-free comfort. Self-fabric binding and 40 singles for extreme softness are its charming elements. Here comes ten colors for you to choose. It also can match your coat in coming cold days, such as Next Level Apparel Unisex Sueded Full-Zip Hoodie. It is made of 60% combed ringspun cotton/40% polyester sueded jersey. 1×1 ribbed cuffs and waistband and dyed-to-match YKK zipper added durability. It features unlined hood. It also owns tens colors and it is ready for screen printing and embroidery. Also, it is unisex fit! Buy some tees for your girls. Next Level Apparel Girls’ Adorable CVC V-Neck Tee is a nice choice. It is made of 60% combed ringspun cotton, 40% polyester jersey. It’s slightly heathered. I suppose you will like the 1×1 baby rib-knit set-in collar with front cover stitch.Tear-away label provides tag-free comfort. Fabric laundered for reduced shrinkage. There are also ten colors for you to choose. Or you want a simple tee? Thus, I will introduce one to you. Next Level Apparel Girls’ Adorable V-Neck Tee will be the answer. It is made of 100% combed ringspun cotton fine jersey. 1×1 baby rib-knit set-in collar is one of the features. Tear-away label provides tag-free comfort. Here comes ten colors. It is ready for screen printing and embroidery. It comes in natural classic style to fit juniors in all figures and it won’t let you down in all the aspects. 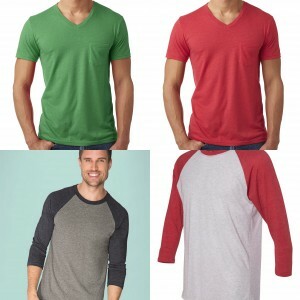 Deliver your manful temperament with a tee that features a V-neck in superb softness. Next Level Apparel Men’s CVC Tee with Pocket is made of 60% combed ringspun cotton/40% polyester jersey. Slightly heathered fabric is the lightspot. 1×1 baby rib-knit set-in collar is durable. I suppose you will like the pocket on the chest for some goods. The tear-away label provides tag-free comfort. Add it into the cart to give yourself a chance walking out of dull and being different and it will surely not disappoint you in choice of both fabric and design. At last, let me show you a special one- the Next Level Apparel Unisex Triblend Three Fourth Sleeve Raglan Tee. It is made of 50% polyester/25% combed ringspun cotton/25% rayon jersey. The 1×1 baby rib-knit set-in collar is one of the charming elements. Satin label is comforable and convneient for you to do any activities. Fabric laundered is for reduced shrinkage. There are moare than ten colors for you to choose. The contrast colors will be the lightspot. Now,comments below to tell me what do you like best!